1: Log in to My Account page and go to Subscriptions tab. 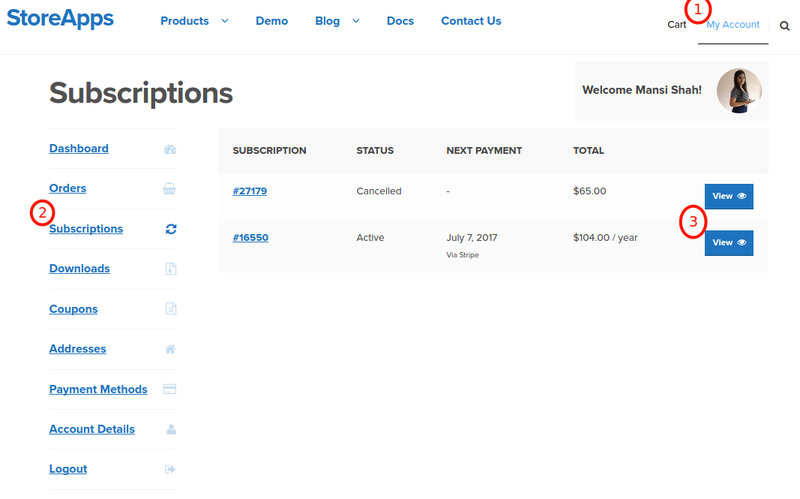 3: From there, you can manage your subscriptions i.e. either you can cancel or re-subscribe or re-activate your subscription. 1. Are Subscriptions Valid for A Lifetime? No, each subscription is valid from the date of purchase and for as long as your subscriptions are in effect. 2. What’s the Difference between a Product License and a Subscription? Licenses were purchased & renewed manually each year, while subscriptions are automatically renewed until you choose to cancel. Other than that, subscriptions work much the same as licenses. If auto-renew is enabled and you had saved your card during checkout, your subscription will renew on the due date and your will be card charged. An email notification and receipt are sent to confirm you paid for another year. You are sent a renewal reminder email 30 days prior to the subscription renewal date (if you have not unsubscribed from our mailing lists). You can also find a renewal information at Subscriptions. These emails are also sent if auto-renew is disabled. 4. What Do I Receive When Renewing My Subscription? Renewing your subscription entitles you to support and updates to your product. This ensures compatibility with newer versions of WordPress and WooCommerce, as well as bug fixes and new features and enhancements to the product. 5. How Much Does It Cost To Renew My Subscription? Cost of renewing differes from subscription to subscription. Please visit your Subscriptions and then click on View buton to find about it. Subscriptions are billed annually. Coupon codes or other promotional discounts do not apply to renewals. 6. What will Happen If My Subscription Expires Or Is Deactivated? 7. My Product Is Free, Do I Need to Renew? 8. Do I have to manually renew my Elite Club Memebership? No. Elite Club Membership is on auto renewal. 1. Are Auto-Renewals Enabled on My Purchases? For purchases made after March 1, 2017, auto-renew is enabled by default. 2. How Do I Enable Auto-Renewals if my license is before March 1, 2017? 3. What Payment Methods Can I Store? Visa, MasterCard, JCB, Discover, Diner’s Club and American Express inshort whichever card Stripe supports. 4. How Do I Disable Auto-Renewals? To disable automatic renewals for a product, visit the Subscriptions tab and click on View. From there click on Cancel button to disable auto-renewal. Note that if you disable auto-renewal then you have to manually pay next year or re-purchase a license at full price if you want to contiune using our product. 5. I cancelled my subscription bymistake. How can I re-subscribe (re-enable / re-activate) it? Login to your account on StoreApps.org and visit the Subscriptions tab. Click on the View button and then click on Re-subscribe button to re-subscribe (re-enable / re-activate) to your subscription.